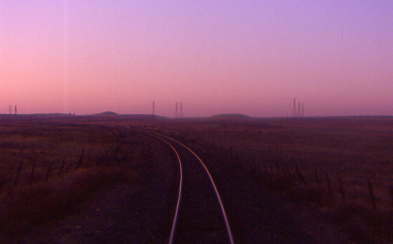 I found on Trainorders.com a post about a Doubleheaded Steam Trip on the Sierra Railroad on November 4th, 2007 and decided to do it. I called Chris Parker and he wanted to go so I got us two tickets for it. I would take Metrolink to LAUPT and meet him there. Chris would rent a car and drive us to Oakdale for the Sunday trip. 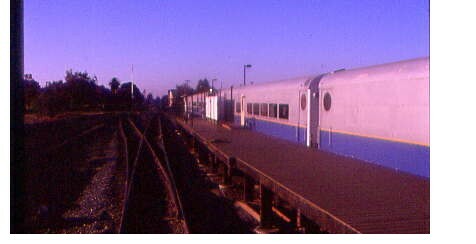 I would take Amtrak back from Modesto and he would fly home from Sacramento at least that was the plan. Chris went to get the rental car the Friday night before we left and they would not give him a one way rental. That meant he had to drive both ways. My plans would change but not until Saturday evening after some great thinking. 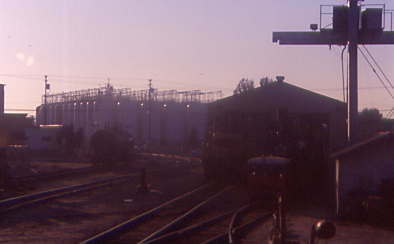 I got up Saturday morning and after finishing packing I drove down to the Santa Ana Train Station and parked. I went over the bridge and bought a Metrolink ticket to Los Angeles. 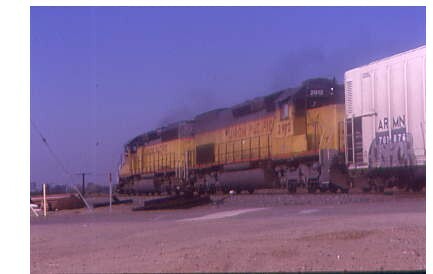 Metrolink 653 came in a few minutes late and I read Railfan and Railroading Magazine as the train made it's way to LAUPT. I spotted Chris Parker on the platform and soon we were driving north on Interstate 5 over the Grapevine to CA Highway 99 north through Bakersfield to the Rest Area south of Tulare. Here I used the wireless Internet to check e-mail and other things on the World Wide Web. We return to CA 99 and continued north. 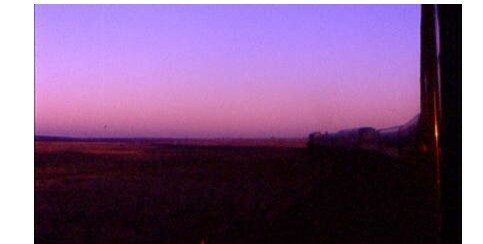 Zacky Farms at Traver has this locomotive at their grain elevator. We pulled off at Kingsburg to see the old Southern Pacific Station under restoration there before we went to Carls JR for lunch. Back on CA 99 we came upon 99 Closed Ahead Exit. We should have gotten off the freeway at that point but did not. The freeway came to a stop and it took forty five minutes of patience to move one mile to exit the freeway. What had happened was a 100 car pileup in the Tule Fog that killed two people in two different vehicles. It happened seven hours before we got there but the CHP was doing a major investigation at the accident site. The scene on Highway 99 when we finally managed to get off California Highway 99 at Manning Road. We detoured west to Cedar Avenue which we took back to CA 99. 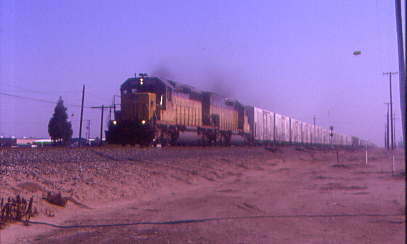 Back heading north we traveled through Fresno and Madera then north of there we caught up to a northbound Union Pacific freight train. 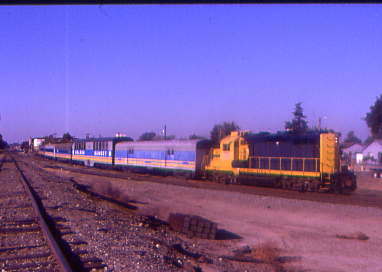 North of Chowchilla, we got off the freeway to set up for a picture of this train. 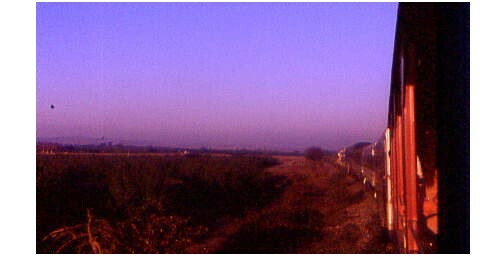 UP 3762 North just outside of Chowchilla. Back on the road we made our way through Merced north to Atwater where we cut over to J7 and caught a southbound BNSF special train of aircraft parts there. From here we stopped for gas at Winton. After a brief stop at Denair we headed north to Oakdale. We stopped by the Sierra Railroad Engine House where the Sierra Railroad 28 was steaming. 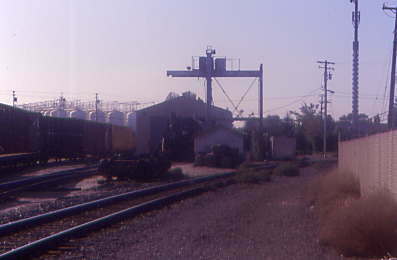 The Sierra Railroad shop in Oakdale. From here we went to a Rite Aid before we checked into the Best Western Rama Inn for the night. I checked the e-mail on the wireless system the hotel has and showed Chris some of the DVD we are in from the NRHS Convention. We then drove back down to the dinner train parking lot. 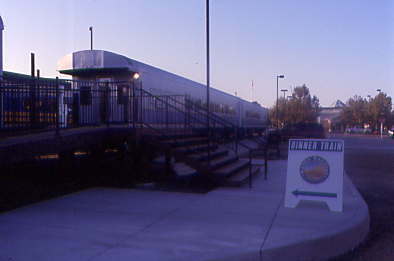 The new setup at Oakdale for the Golden Sunset Dinner Train which is across the street from the former station now a Mexican restaurant. 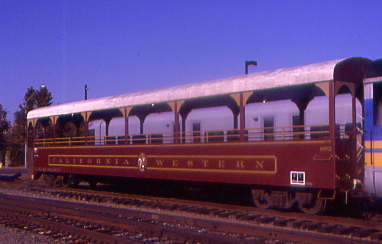 The passenger cars are the offices of the Golden Sunset Dinner Train, kitchen, train man's office and the future gift shop as well as bar room for waiting for the train boarding. The sign that leads you to the check in table. 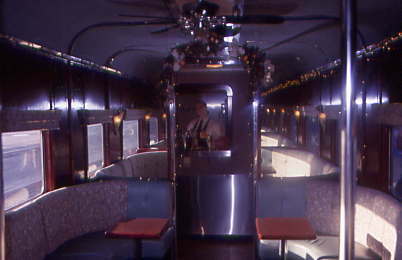 All passengers check in at this table to get car assignments and are checked to make sure what they ordered for dinner. 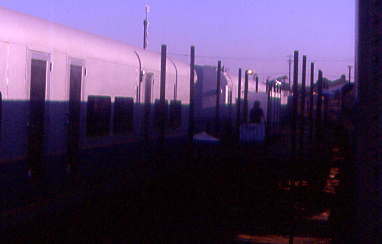 The train side view of the new boarding area. 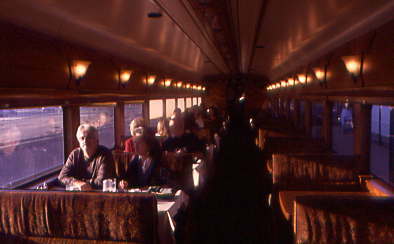 The Golden Sunset Dinner train was made up of a Sierra GP-9u 50, Power Car, SERA 7005 El Capitan, SERA 7007 Lounge, Yosemite Falls Table Car, Half Dome, Yosemite Valley SERA 7000 and the Cal Western Open Car 692 Quiburi Mission. 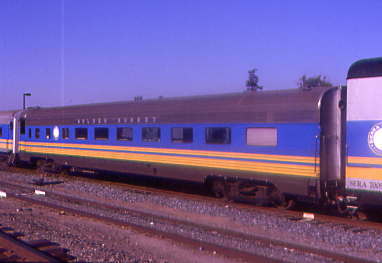 We were seated in the Yosemite Valley, the home built table car from another of the ex Long Island commuter cars. Only the circular window in the doors give away this beautiful wooden interior car's origins. 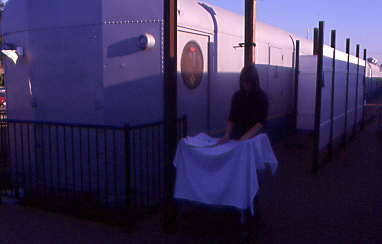 It used to carry hundreds of commuter to and from work and now only happy dinner train passengers. 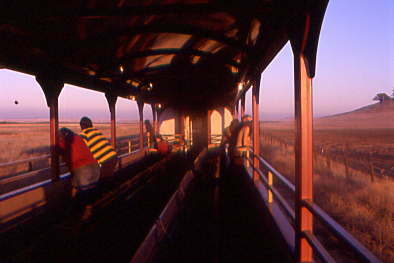 Now a few pictures of the cars that make up this wonderful Golden Sunset Dinner Train. 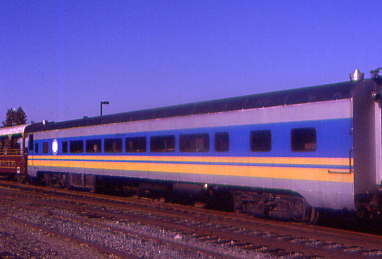 The motive power on our train was GP-9u 50. 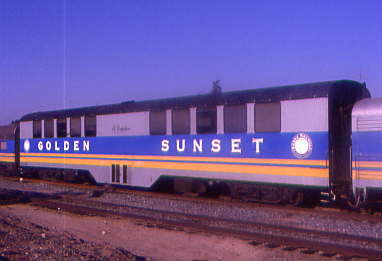 The rear of the Golden Sunset Dinner Train. 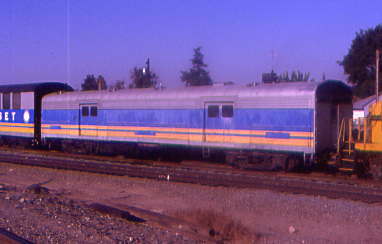 The California Western and Yolo Shortline are all part of the Sierra Railroads extended family so cars can be used on any of their passenger train operations. Because of this arrangement, this time I could ride out in the open air car before dinner. 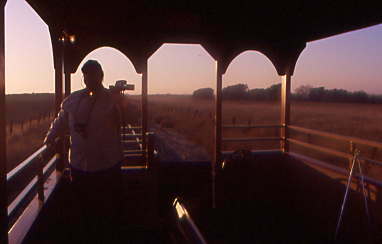 Chris Parker on the Golden Sunset Dinner Train. This trip will be Chris' first Dinner Train experience. 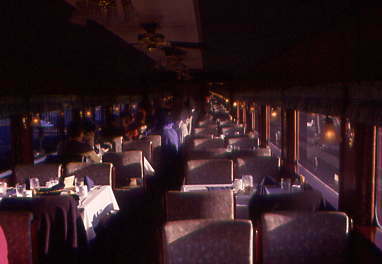 Chris then took a picture of me on the Sierra Railroad Golden Sunset Dinner Train. On the table there was bread in a basket with butter in a dish. 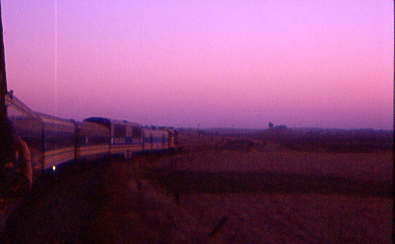 I then took a walk through the train. 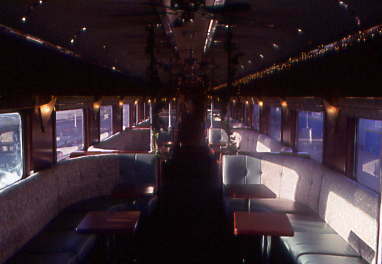 Inside of the lounge car. Back inside the Yosemite Valley. I enjoyed the bread and some Coca-Cola as we prepared for our departure time. 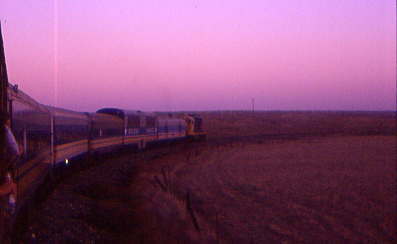 The train left Oakdale at 5 PM to start our trip as I rode in the open car until the sun set. 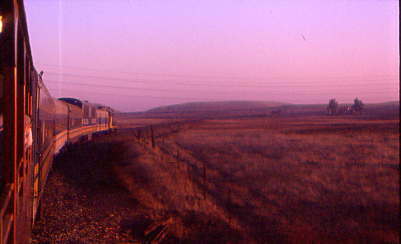 The train left the Oakdale station behind. 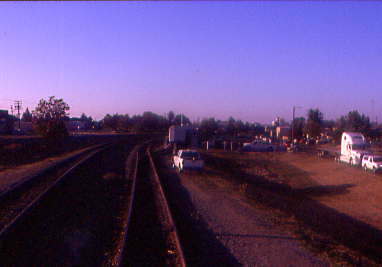 Next we passed the Sierra Railroad shops. Once out of town I tried for a unique picture. 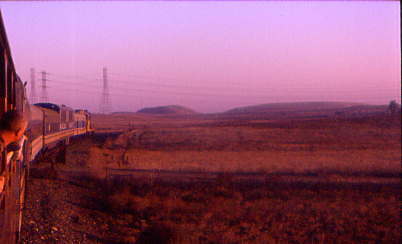 Looking down the train in the late afternoon light. 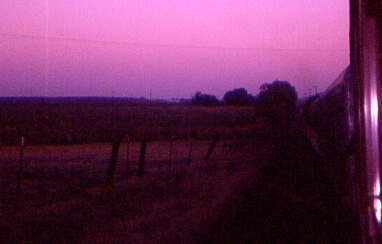 A look back at a tree line. 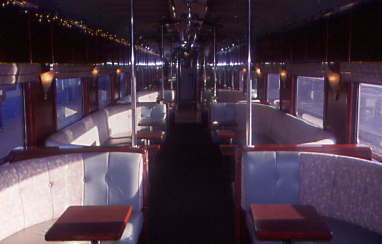 The view inside the open car. 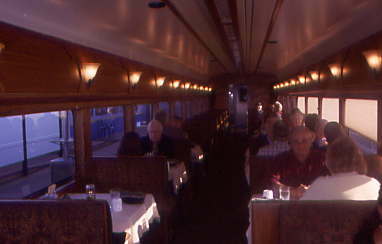 Chris Parker enjoying his first trip on the Sierra Railroad and it's dinner train. Rounding the curve before I started pointing out photo runby locations to Chris from previous photo trains that I had taken on this unique railroad. Another curve, another picture. I went into the train to find a bowl of Butternut Squash Soup. The train took another curve. 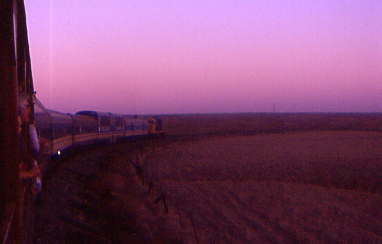 Our train keeps going as the sun sinks lower in the sky. 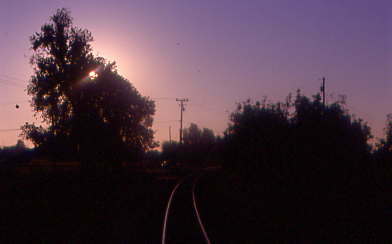 A look back down the rails. 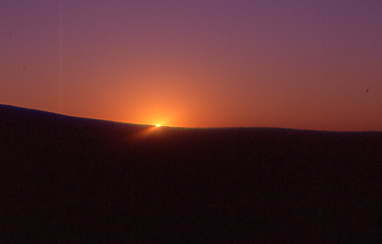 A look at the sun going down behind that hill. The train took yet another curve. 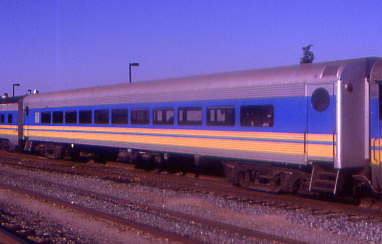 What a great looking train. 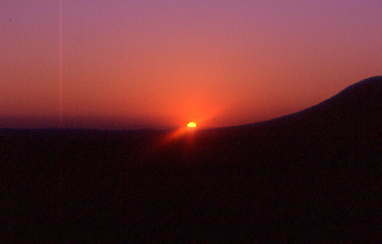 The last light of the day. 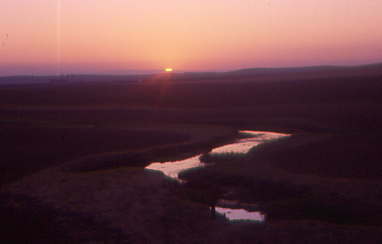 The final sunset of the day. 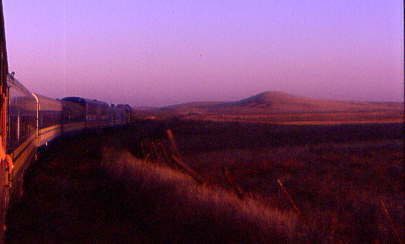 A look back towards the west as we near the Dodge City Curve. 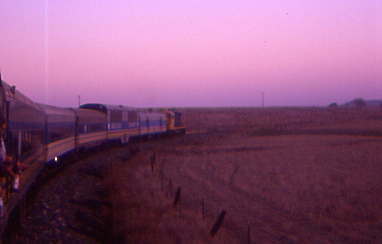 When it got dark enough, the flood light under the car took hold lighting up the view outside the train. The train passed the Turkey Barns with hundreds of those creatures inside. On my last trip on the Dinner Train I was told why the Turkey Farms had to have roofs on their building. If they didn't have a roof and it rained, the turkeys would turn their necks up and try to take a drink but wouldn't close they mouths and would drown standing up. Are they the dumbest animals? Next the main course was served. We enjoyed the "Flat Iron with Red Wine Demi and Sliced Mushrooms" served with Scalloped Potatoes and Glazed Carrots. 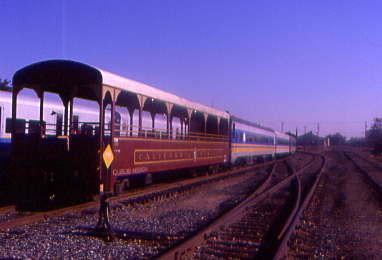 The meal was excellent and I finished just as our train arrived into Warnersville. 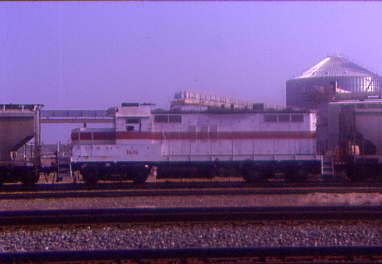 Here our engine would run around the train. 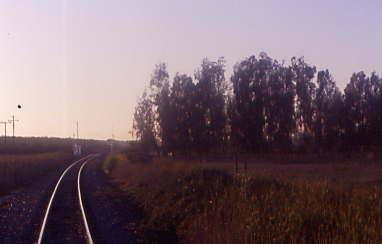 After the power had reconnected to our train, we started back to Oakdale at 6:46 PM. For dessert, Lemon Tart was served and was excellent. 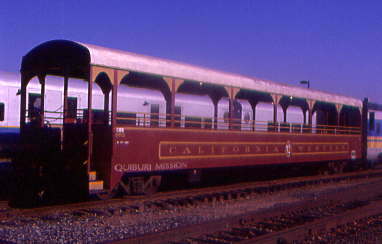 Chris and I talked all the way back to Oakdale where we detrained finishing a most wonderful trip on the Sierra Railroad Golden Sunset Dinner Train. Chris and I drove to a market to get some sandwiches for tomorrow's trip on the Sierra Railroad before we returned to the Best Western Rama Inn for the night. I checked the Internet before we watched the end of Austin Powers before we called it a night.